Our orders are consistently filled and received in a timely manner. Shipments are packaged well and accurate to our purchase orders. Great Customer Service. Thanks to everyone at Sapona but special thanks to Tracy Johnson who is always so helpful in getting our orders shipped in a timely manner. 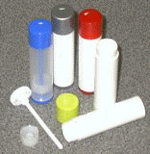 Sapona Plastics is a low cost leader in the lip balm container market. You will benefit from our high cavitation tooling and high speed assembly. Quality is excellent and service is unmatched in the market, with stock inventory to meet immediate needs and flexibility to match any special color combination required. •32% post industrial recycled material content sourced from internal regrind. •Produced under FDA cGMP compliant quality system and ISO 9001 certified quality system.